[APRIL 12, 2001] Lincoln has a new state champion it can be proud of. 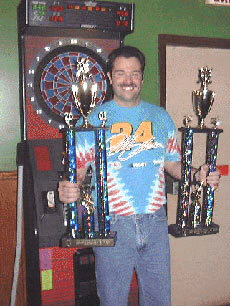 Brian Dutz captured an unprecedented two state titles in the 2001 State Dart Championships recently at the Civic Center in Peoria. Never before had one individual won two state singles titles in darts in Illinois. Competing against 218 other contestants, Brian won the 501 Open Singles title. Then he defeated 185 competitors for the Open Singles cricket title. For those unfamiliar with the game of darts, 501 is a countdown game, with each score/hit subtracted from the previous throw. The object is to get to zero first. Cricket is a bit more complicated. In cricket, scores count only when the numbers 15 through 20 and the bulls-eye are hit. All of these must be hit three times each to win. Once a player has hit a number three times, all subsequent hits of that number will continue to tally until the opponent has hit the number three times. This "closes out" the number for further scoring. Highest score wins. Brian has been throwing for 15 years, the last 14 competitively. He quit for a few years, but at the urging of his wife, Mary, he resumed throwing. This time he took it more seriously, practicing 1½ to two hours daily in the family room in their basement. His play began to improve, culminating in his state titles this year. Darts may be his sport, but not his life. Brian is a devoted husband and father, finding time to help son Blake with his baseball and daughter Katelyn with her volleyball and other activities. The game of darts has its origins in the pubs of Merry Ole England. Today, competitive darts can be found thriving in the pubs, or rather drinking establishments, of Lincoln. Brian, or "Dutzie" as he is known to his friends, can be found on Wednesday evenings at the OK Tavern, competing with his team, the Crackshots. 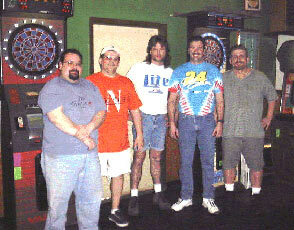 Dutzie has been with the Crackshots (Brian Green, Rick Sullivan, Keith Yeazle and Danny Hall) for the last 10 years. Sunday afternoons, Dutzie can be found at Al’s Main Event, crushing the competition, with teammates Rod Clarke, Randy Cox, Jodie Campbell and Scott Sherren. This past Sunday was a typical afternoon for Dutzie. With music blaring from the jukebox, high fives being tossed around and beverages-of-choice disappearing, Dutzie stepped to the line in the final game of the afternoon — 501 doubles. His team needed only a 14 to win. Did Dutzie go for the spacious 14 on the board? Mere mortals would take that easy route. In the fashion of a true champion, he nailed the wafer-thin slice of double seven — for 14 points and the win! For those of us who have a dartboard in our basement and enjoy playing, you can get out to see Brian at the aforementioned places. The level and quality of play are something to behold. You’ll see a dart thrower worthy of being called state champion. Congratulations, Brian. [APRIL 11, 2001] A proposed new three-year contract for animal-control services provided by Logan County to the city of Lincoln drew sharp criticism from Alderman Stephen Mesner at a work session of the city council Tuesday evening. Mesner questioned the fairness of the agreement, saying the county charges fees to Lincoln and other municipalities for the service but does not contribute a fair share of county funds to animal control. "The city is paying $27,000, and the county hasn’t paid a dime," he told the council. "The county writes in $10,000 in its budget for animal control, but they don’t spend it. I think the people of the city of Lincoln need to know about it." The proposed budget, submitted for discussion by Alderman Benny Huskins Sr., chairman of the animal-control committee, calls for the city to pay the county $27,951 per year for the next three fiscal years. The city has had such a contract for the past two years at the same price, Huskins said. The contract states that Logan County will "furnish, operate and maintain an animal shelter and pound for lost, strayed, captured, surrendered or homeless dogs and cats" and shall "dispose of such animals as provided by statute." It shall also employ people to run the shelter and carry out other duties. Mesner said the city’s police officers, not county personnel, do most of the work picking up stray animals. City Attorney Jonathan Wright agreed that the city police department usually responds first and "does quite a bit of the enforcement." Alderman George Mitchell asked what fees the county is allowed to keep. According to the proposed contract, Logan County retains animal registration fees, along with rabies inoculation, housing, neutering and adoption fees. Huskins said he had not seen the county budget for animal control but would attend the next meeting of the county’s animal-control committee and ask questions about costs and fees. "The county is mandated to do it," Huskins said. " We have an ordinance on the books, and we are paying them to enforce our ordinance." Mayor Joan Ritter pointed out that the county was not asking for an increase in fees for the next three years. Mesner, who is retiring from the council in May after an unsuccessful run for mayor, said if the ordinance came up for a vote while he was still on the council, he would not vote for it. "I don’t say we shouldn’t have an agreement [with the county] and pay them, I’m saying come on, let’s be fair." In other business, the council heard a report from Paul Smith of T & T Truck and Trailer Service on his plan to have his business included in an enterprise zone. Smith plans to add a state-approved truck inspection lane, at a cost of about $250,000, which would be the only state-approved lane in Logan County. He would also add several new employees. Robert Menzies, Logan County regional planning commissioner, told the council the commission had gone on record in support of adding the property to the enterprise zone. Smith said he believed the addition to his business would be an asset to the city, as it would bring owners of semi-trailers and farmers with tractors to Lincoln for inspections. The closest place now to get such an inspection is Mason City, he said. The council agreed to put the matter on the agenda for next Monday’s regular meeting. Alderman Mesner, chairman of the insurance committee, reported that costs for health insurance for city employees will go up again this year, from $372 per individual per month to $401. Costs for family care, now $976, would go up to more than $1,000; however, the city presently has no family memberships on its health care program. Mesner said usually quotes on health insurance rates come in so close to the new fiscal year that there is little time to look for alternative insurance plans. However, he said some new health insurance programs are coming out in July of this year, and he urged the council to look at them when there is time to consider making changes. "Eventually we’re not going to be able to pay for this unless we get the costs under control," he said. Plans for the new 16-lot east-side subdivision, proposed by Rodney White of New Holland, were discussed briefly. White has asked that the city absorb the entire cost of upgrading Sherman Street, which the lots will face, so he can sell the lots at a reasonable price. He has asked for some kind of commitment from the city for the street upgrade to be made in three to five years. City Attorney Wright noted that the city does not have legal authority to enter into a contract of this type for more than one year. Even if such an agreement was made, it would not be binding on a future council, he said. White said he would go ahead and present his proposed subdivision to the plan commission and continue to look for ways to reach an agreement with the city. Bob Steele presented his plan to have a soapbox derby in Lincoln during the weekend of the balloon fest and art fair. He said he had the approval of the chamber of commerce, which is furnishing a $1 million blanket insurance policy for the event, as well as the approval of residents and businesses along the Kickapoo Street location where the event will be held. The derby plan was also put on the agenda for a vote at the regular meeting April 16. [APRIL 11, 2001] Bob Steele of 25 Tulip Drive in Lincoln is hoping to bring area racing to this year’s balloon fest. There won’t be any obnoxious fumes or incessant noise of motors grinding through the calm air in Lincoln. Just perhaps the noise of a lot of kids and their parents having fun together. Steele hopes to have a soapbox derby race this summer and use the event and the participation as an impetus to have a sanctioned Soap Box Derby organization in Lincoln. Mount Pulaski currently has their own association and fields up to 25 members and their cars in two events tied into Mount Pulaski summer events. Steele hopes that Lincoln families will be interested in creating their own club and going over to Pulaski in future years "to win a few of their trophies." Pulaski racers, of course, will be invited to Lincoln events, with the hope that such a family activity with a broad county base will help bring the community together. Steele already has received approval from the chamber of commerce to have the races during the balloon fest and now is awaiting city council approval to start the momentum needed to field racers. Since Soap Box Derby associations are commonplace throughout the country, it would seem that council approval of this venture should be swift and positive once the logistics for the event are laid out. Steele, a retired lumberyard owner, has extensive experience with soapbox racers and is willing to walk any family interested in becoming involved through the basics of fielding a car for the potential races. He stated that families can go any of three ways to get a car ready for competition. A family can purchase a kit or custom build their own or purchase a used racer at a price that Steele says carries the least expensive cost of the three options. Soapbox racing is open to children 7 years of age to 16 and is a national pastime for families across America. Steele was quick to point out that until city approval is received, the race is not officially set for this August. However, families who are interested in joining a new Lincoln Soap Box Racer Association can get in touch with Bob at 732-9983 to receive more particulars on this family-oriented pastime. 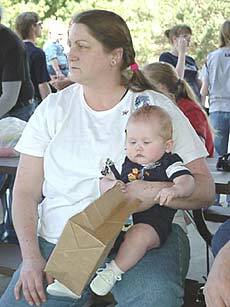 [APRIL 10, 2001] Choosing your child’s day care or preschool can be a difficult decision, considering location, hours, curriculum, staff experience. To make the best choice, parents have to locate each day care or school and interview the directors or teachers. This is a lot of work! To help parents reduce some of their research time, LDN began to research local day-care centers and preschool programs. Before delving into the programs, facilities and hours of operation, a few common misconceptions need to be corrected. More than one day-care director stated that day care is not just baby-sitting. Yes, the children are being watched; but day-care workers also teach the children through play, love the children and provide a sense of security for the young ones. One director said parents believe that because day care is so costly, day-care workers make a lot of money — when in fact, the day-care profession is one of the lowest paid careers. The average salary, even for those with college educations, is $6 per hour! Listed below are brief descriptions of the day-care centers found in Logan County. Joni McAllister directs the Child Development Center, which began in July. They have four day-care classrooms, for children who are 15 months to 5 years old. They also have two Head Start classrooms, for students ages 3 to 5. The day-care workers have either 30 college credit hours (with six in early childhood development) or 60 college credit hours (with 18 in early childhood). The Head Start teachers and assistants have either degrees in early childhood or CDA credentials—meaning they have 12 college credits and plenty of on-the-job training. Joni McAllister is in the child-care profession because she enjoys it. As a mother of young children, she understands how difficult it is to find day care and how costly day care can be. Child Development Center is slightly more expensive than the other Logan County day cares because the center adjusts rates to the state level. McAllister is also trying to pay her staff little more, since she believes most child-care workers are underpaid. The Development Center’s Head Start program is a granted program, so families who qualify can get financial help for their child-care expenses. McAllister recognizes that many day cares in Logan County have quality programs and people, just like her center. She also knows that "every center in town struggles to keep qualified staff." McAllister advertises the Child Development Center as a fun, quality program that offers an additional choice to Logan County’s parents for child care. Applications are accepted year-round at the Child Development Center; just stop by. Ruth Ann Hart is the director for Christian Child Care (CCC). She works with CCC because she loves children and believes it is "one of the gifts God gave me—to work with children." CCC has 13 teachers and eight teacher assistants—many of whom are also qualified to be teachers. According to Hart, the teachers are more than baby sitters. They educate and love the children and offer a sense of security. Director Hart encourages parents to choose CCC because it shares the love of God with the children and provides high-quality day care. CCC does have a waiting list, so interested parents need to call as soon as possible. Some parents put their child on CCC’s waiting list before he or she is born! Little Lambs Day Care is a ministry of New Wine Fellowship and has been serving Lincoln since 1984. All of their teachers are state certified, and several of their teachers meet or exceed the DCFS standards. Gretchen Jones is the day-care director. She has a bachelor’s degree in psychology. Jones is in the day-care profession because she loves the children and believes that it is a pleasure to work with them. She knows that parents must leave their children for extended periods of time during the day, so she is happy to provide a safe, fun and enjoyable atmosphere for the children. 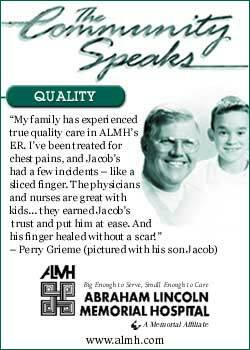 Jones knows that parents want the best care for their children; for example, that their infants are held regularly. Many parents have complimented Little Lambs’ cleanliness and adult-child interaction. When there is an opening for a child at the day care, Jones calls the parent or parents to come to the center, inspect the facilities and talk to the teachers. The staff wants to be sure that parents recognize Little Lambs as an "environment where parents feel at peace and comfortable with leaving their children." Brenda Lynch is the director of Noah’s Ark Nurturing Center. She loves children, likes working with them and enjoys watching them grow in a day-care setting; that is why she completed an associate’s degree in early childhood development. Noah’s Ark has four qualified teachers, three teacher aides and two directors. The center offers educational activities and toys but does not have structured class sessions. Brenda Lynch believes that Noah’s Ark is important to the children who attend because it is a Christian day-care center. Many of the families of the children who come to Noah’s Ark do not attend church, so the teachers capitalize on their opportunity to teach the children about Jesus and Christian values. Noah’s Ark is located in a building that used to house a church, but the day care is not affiliated with any particular denomination. Under Senate Bill 1505, the state would create an ombudsman to coordinate information about the various government and non-government insurance plans that are available. "Many uninsured people, or those who are about to lose their health insurance coverage are simply not aware of the various programs that exist to help them obtain insurance," said Madigan (R-Lincoln). "For example, there are several state programs, such as KidCare and the Comprehensive Health Insurance Plan, which were specifically created to help those who are uninsured because of an inability to afford coverage." Additionally, the ombudsman would provide information on private-sector insurance plans. Madigan’s legislation also would allow counseling for the uninsured in the discovery, evaluation and comparison of options for obtaining health insurance coverage. Counseling could be one-on-one or through public forums. The Senate approved the proposal on a 55-0 vote, sending the measure to the House for consideration. [APRIL 9, 2001] Thursday was Elkhart’s Action Planning Session—the fourth meeting of their MAPPING process. For the past three months Nancy Richman and Steve Kline, of the Management And Planning Projects Involving Nonmetropolitan Groups program, have been guiding the community of Elkhart through the planning process for community improvement. During the first three planning sessions, residents vocalized four main goals for improving their town, listed projects to reach those goals, and prioritized the suggested projects. The agenda for the Action Planning Session was twofold: List informational resources the community needs to begin the projects and plan the presentation for the entire town. The meeting began with four different groups summarizing the projects they want to implement in the next three to five years in order to reach one of the specific goals. The four groups even separated those projects they definitely plan to pursue from those they hope to pursue. The first goal the resident planners vocalized is to increase Elkhart’s population. In order to do that, the planners want to bring businesses to the town and expand the town’s utilities for businesses and homes. Other projects the group hopes to work on are advertising and community beautification. The second goal, high-quality K-12 education, will be met by creating a community task force and ensuring the schools get proper funding. The group hopes to expand technology, begin a tutoring program and add to the extracurricular activities at Elkhart Grade School. The third goal is to create a stable business environment. The one project slated to reach this goal is a new power generation plant. Other projects the group hopes to begin are a town grocery store and tourist or recreational attractions. The fourth goal of a competitive, sustainable, convenient community will be met by increasing the amount of family housing. The group also hopes to begin a community day care center and welcome wagon. Richman and Kline shared with Elkhart’s planners how impressed they were with each group’s detail. Not only had the groups brainstormed many community-improvement projects, but they also vocalized ways of measuring their progress. Following the four group reports, Richman and Kline introduced Robin Hanna of Rural Economic Technical Assistance Center (RETAC). RETAC, just like MAPPING, is a branch of Western Illinois University’s Illinois Institute for Rural Affairs (IIRA). RETAC is a funding resource for small Illinois towns. RETAC does not write checks but tutors communities in economic matters and points them to groups that do write checks. Hanna’s experiences provide him with ideas for helping communities. Throughout his presentation he shared stories of how other communities accomplished the same goals Elkhart wrote. He described how those towns overcame challenges in the same projects Elkhart envisioned. Based on Hanna’s funding presentation, the planners noted resources he mentioned that they wanted: guidelines for zoning, information on attracting businesses, plans for developing housing and much more. During one of the breaks, Lincoln Daily News was able to ask some of the planners why they had become involved in the MAPPING process. Jeff Gustafson, an Elkhart resident for three and a half years, believes that Elkhart is a special town and friendly community with a lot of potential. He sacrificed some of his vacation days from work to help other residents turn Elkhart’s potential into reality. Another longtime Elkhart resident sees the MAPPING project as a key to the town’s growth. She said that there was a need to pull ideas, because in the past residents have held different opinions about community improvements. She believes that the MAPPING process will help to unify residents around one comprehensive plan. That theory will be tested in the upcoming town meeting. On Thursday, May 10, the resident planners will present their goals and project ideas to the entire community. The planners hope to rally full community support for their vision and ideas. All Elkhart residents are invited to the 6:30 p.m. meeting at the grade school. If the town meeting goes as well as all of the planning meetings, Logan County will see Elkhart begin to grow over the next three to five years. [APRIL 9, 2001] What do smiling faces and eggs have in common? The annual Easter egg hunt in Elkhart. 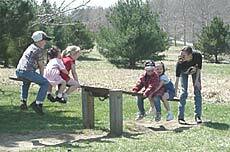 This year’s hunt was Saturday, April 7, in the Village Park of Elkhart. Over 950 eggs were hidden for the nearly 75 youngsters to find. Each egg contained candy and, in some cases, certificates for prizes. Prizes included play dough, bubbles, jumbo boxes of crayons, sidewalk chalk and hula hoops, walkie-talkies, water cannons, assorted board games, and cameras. Cash prizes included $5, $10 and $20 awards in each of the four age groups. Les Reeley, village board trustee, chaired the event, with Ann Curry, Charlie Matthews, Cherri Reeley and Hallie Reeley assisting. Funds for the Easter egg hunt were contributed by the Needs and Goals Club of Elkhart and the village board. Thanks to the generosity of these volunteers and others, lots of smiles and happy faces were seen throughout Elkhart. 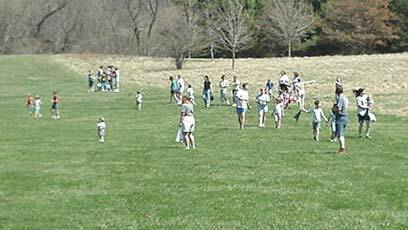 [APRIL 9, 2001] Take hundreds of youth, place them in a large sunny park and say, "GO!" Then sit back and watch the fun. Within moments kids start popping up with brightly colored plastic eggs filling their baskets. They’re so fast it’s almost like watching the rabbit himself. With only one rainout in its history, A Brotherhood Aimed Toward Education hosted its ninth annual Easter egg hunt at Kickapoo Creek Park Sunday afternoon. The children were divided age groups: ages 1 to 3, 4 to 8 and 9 to 12. In less than 30 minutes the 158 dozen (that’s nearly 2,000) brightly colored plastic eggs ABATE put out had been found. The eggs were filled with certificates and candy. The certificates were turned in for cash, other candies and grab-bag prizes. ABATE of Illinois is a neutral nonprofit organization that allows all riders to unite in A Brotherhood Aimed Toward Education. ABATE works to safeguard motorcycling rights, while allowing members to be individuals with different views. [APRIL 7, 2001] A video featuring young lawyer Abraham Lincoln as he was when he lived in and visited the area is in the works. The plans are being put together by volunteers in a subcommittee of the Looking for Lincoln project. The project will be funded by a grant from the state of Illinois. The video is intended promote Lincoln as a tourist destination. It will be distributed through varied tourism channels to encourage tourists to come visit Logan County. Videos will also be made available to purchase for those who are interested in owning a copy. Members of the subcommittee putting the video together are Paul Beaver, Paul Gleason, Steve Sauer and Charles Ott. Listed below is a sequence of the towns where Lincoln visited and worked in Logan County before he was elected president. The video will present these sites and the related history. Postville (Courthouse) — Lincoln was an attorney at Postville during the spring and fall sessions of court in the new Logan County Courthouse (Postville) in the new county of Logan, which was created in 1839 by Lincoln when he was a state legislator. Lincoln often played "townball" and marbles with the local children in nearby Postville Park. He stayed at the Deskins Inn, which was across the street. The well from which he drank is still there. Mount Pulaski (Courthouse) — During the 1840s Lincoln often was an attorney for local citizens and handled their legal matters. Mount Pulaski was the county seat of Logan County from 1848 until 1854, when the newly constructed courthouse in the city of Lincoln was completed and became the county courthouse. Atlanta — While Lincoln traveled the judicial circuit, he often stopped in Atlanta on his way to Bloomington after the conclusion of court in Logan County. 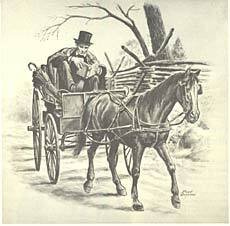 Two of Lincoln's friends in Atlanta were Sam and John Hoblit, with whom he often stayed the night. One night in 1858, Lincoln stayed in a carriage house on the Hoblit farm when all the rooms in the main house were occupied. This small building still stands on the farm. On July 4, 1859, Lincoln spoke at a large Fourth of July celebration in Turners Grove (near the Atlanta Cemetery). He was presented a silver-headed cane at this time. One year later, he was nominated for the presidency. Lincoln, Ill. — Before Lincoln was famous, he was involved in helping create the first town to bear his name. In the summer of 1853 the Chicago and Alton railroad line was constructed and ran directly through Lincoln. Mr. Lincoln christened the town of Lincoln at this site. This was also the site of Lincoln's farewell speech in Lincoln and the site where his funeral train passed in May 1865. He appeared in Lincoln as both a lawyer and judge on many occasions in 1858 after the completion of the Logan County Courthouse. Elkhart — Some 10 miles south of Lincoln rises Elkhart Hill, scene of one of the county's earliest settlements, where the James Latham family lived. Most of this landmark became the property of John D. Gillett. Gillett was born in Connecticut in 1819 and moved to Logan County in 1838. He established a farm at Bald Knob near Cornland. After Abraham Lincoln was selected as a presidential nominee, he visited his good friend Gillett in Elkhart to ask him to help in the upcoming election. After Lincoln's election, he also asked Gillett to attend his inaugural. 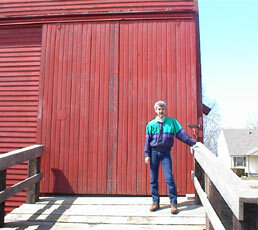 Gillett accepted the invitation and attended the inaugural in Washington, D.C.
[APRIL 6, 2001] Three restoration projects for the J. H. Hawes Grain Elevator Museum in Atlanta are planned for this spring and summer, two of them funded by a matching grant from the Illinois Historic Preservation Agency. In March the IHPA approved a 60/40 matching grant totaling $16,200, with the local share being $6,480. This money will be used to tuck-point the inside foundation of the elevator and to install electricity for lighting to bring out the architectural features. Sunday, April 8, from 11 a.m. to 1 p.m. at the Atlanta firehouse there will be a spaghetti dinner to support the Hawes elevator. The menu offers spaghetti, salad, garlic bread, drink, and homemade pie and cake, all for a donation. Proceeds will be used to meet the local portion of the matching grant. The third project expected to be completed this summer is construction of a railroad siding next to the elevator. Bill Thomas, chairman of the J. H. Hawes Grain Elevator Museum board of directors, said the time frame for a wooden boxcar to sit on the siding is less certain. He has contacted several railroad museums and associations but has not yet found an available boxcar. The J. H. Hawes Grain Elevator, built in 1904 and operated as a commercial enterprise until 1976, is the only fully restored wooden grain elevator in Illinois listed on the National Register of Historic Buildings. The museum was dedicated on July 17, 1999. 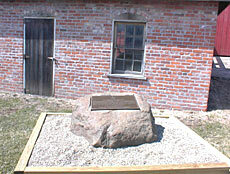 On March 4, 2001, the Illinois state organization of the Daughters of the American Revolution (DAR) also recognized it as a historic site. The DAR dedicatory plaque describes how the elevator operated: "This restored elevator demonstrates the general handling and storage of grain of that era [early 1900s]. Grain was dumped into a pit and, by a system of belts and pulleys powered by a single cylinder engine, was elevated to storage bins and eventually moved out to rail cars." DAR State Regent Mrs. Robert W. Mitchler dedicated the marker before a crowd of 150. Thomas said one goal of the museum board is to develop a plan for conducting field trips for elementary and middle school students. Though volunteers have guided many adult groups through the elevator, elementary students are considered a special audience requiring a different approach. Thomas, a former elementary principal and middle school history teacher, said the tours will be "a very active experience" for the students. He hopes to start the school tours in the fall. Thomas said a long-range goal is to erect or acquire a second building to house agricultural exhibits. According to the museum brochure, grain storage facilities first became important as pioneer farmers produced crops beyond the needs of their families. By the mid-1800s milling and distilling industries created a market for the excess grain, and the railroad built through Atlanta in the 1850s provided a means of transportation. First flat storage warehouses, then bridgelike granaries built over the railway provided facilities to store and transfer the grain. Responding to the need for new technology, John H. Hawes, a farmer and grain dealer, built his elevator between April and August 1904. He used a gasoline engine to power the vertical bucket conveyor system that raised the grain to the top of the 60-foot elevator and dumped it into vertical storage bins. The brick engine house has been reconstructed with period materials and a 1920 Fairbanks Morse gasoline engine donated by Eminence Grain and Coal Company of rural Atlanta and restored by Deane May of Atlanta. A period wooden scalehouse, originally used at the CrackerJack Company in Chicago, illustrates the way grain was weighed by the wagonload. The Stanford Grain Company of Stanford donated the scalehouse, and Eugene Craft of Atlanta donated the period scale mechanism. The elevator’s 97th birthday will be celebrated on Sunday, June 3, from 2 to 4 p.m. The Atlanta Community Band will provide music, and refreshments will be served. A special highlight for the day will include an authentic re-enactment of the elevator's early days. A team of horses will arrive delivering a grain wagon, to demonstrate the elevator’s operation. The birthday celebration also opens the summer tour season. The elevator, engine house and scalehouse are open to the public on Sundays during June, July and August from 1 to 3 p.m. Special tours can be scheduled by calling (217) 648-2056 or (217) 648-5077. All tours are free, and donations are accepted.